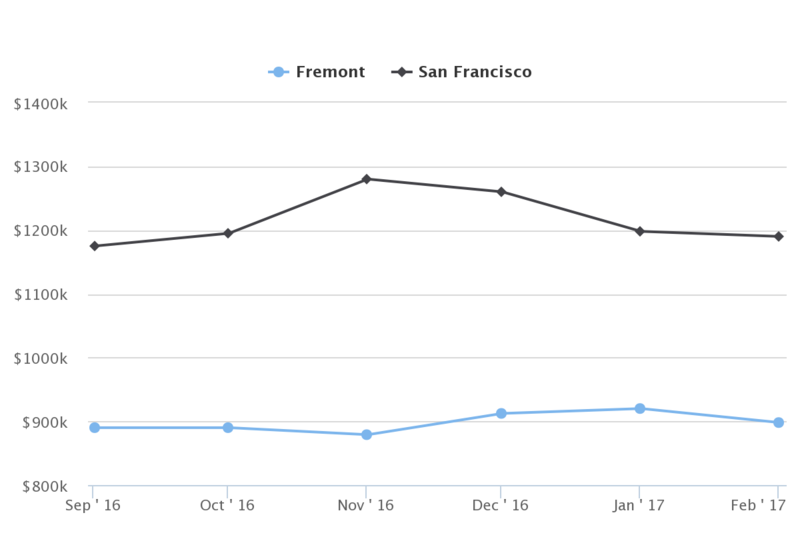 While January showed the signs of increase, the overall market in the Bay Area is topping. Prices are creeping up only 1-5% a year, unlike few years ago. Some desirable areas show the signs of market going sideways due to it’s affordability by local workforce. Going sideways means creeping up slowly. If you are buying for yourself – it is a good time since real estate always grows over long period of time due to inflation, people coming to the Bay Area, and lack of new land. However, short term investors must be careful, as the profit margins on house flips have decreased. Interest Rates have always been tightly connected to the Real Estate Market. According to the recent news Yellen (Chair of the Board of Governors of the Federal Reserve System) hinted on slight increase two or three times during 2017. It is possible, by the end of the year we will see interest rates close to 5%. Today’s rate is 4.125%, which is historically low and favorable for the long term homebuyers. Inflation moved up over the past year, mainly because of the diminishing effects of the earlier declines in energy prices and import prices. Chinese Cash Buyers still show interest in the Bay Area Houses, driving the prices up. Buyers with H1B visa are confused by the upcoming changes to the visa program. Realtors in the Bay Area are seeing some offers being withdrawn after submission due to the uncertainty. Stock Market at the record high because of the promises of the new administration, including deregulation policies. Lots of building permits have been issued by the cities around Bay Area. Mostly in San Francisco. The construction of many housing units already began and will supply the market in the coming years. Rising rates will also limit the ability of developers to raise prices, pinching margins. Buyers will look for smaller, cheaper homes and builders will probably look for opportunities to accommodate them. West Oakland is being gentrified due to it’s proximity to San Francisco. Prices are up, but the area still has a long way to go. Brentwood has good schools and affordable prices (approx. $205 per sq ft), BART extension to Antioch is expected to start service this winter. Antioch is located within 15 minutes driving from Brentwood. Schools, BART access, and proximity to Livermore makes Brentwood an attractive option. Prices in those areas climb higher due to the affordability and higher turnover, also, high interest from investors. Should you have further questions about market trends, or a particular property, contact me for a free consultation. For more detailed market analysis fitting your goals and finding the best deal around, meeting the investment partners, schedule a personal appointment or come to one of my seminars.